Do you want to know how you can tell that something was REALLY good? If you look at a picture of it two weeks later, when you are super full from a huge Easter lunch, and your mouth waters and your stomach growls.... you know it's good. 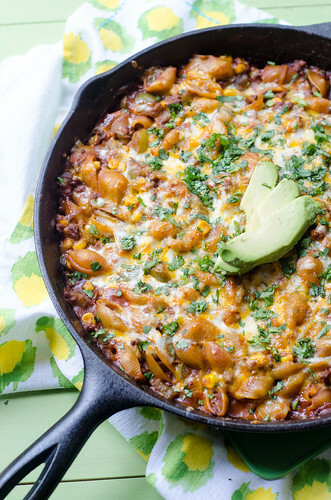 This skillet tex-mex macaroni is not only amazingly delicious, but it's cooked in under 30 minutes, and only dirties one pot. 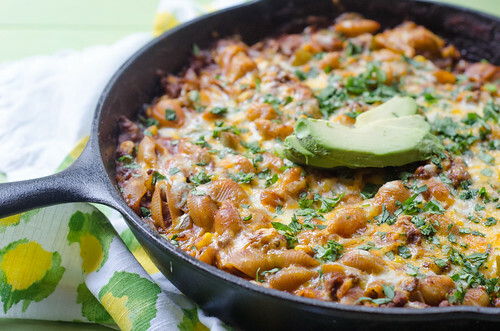 It makes a perfect weeknight dinner, and it has all your bases covered: Mexican food, pasta, spice, cheesiness, and it's reasonably healthy. 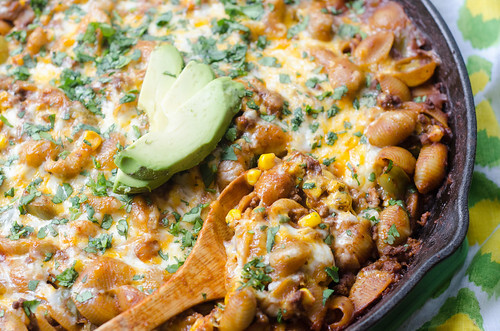 This skillet meal reminded me a bit of hamburger helper, but obviously it's better. Joey and I really really loved this, and my mom asked for the recipe when she ate the leftovers for lunch during a visit. I really just cannot say enough good things about this dish, so I'll leave you with this: rearrange your weekly meal plan and squeeze this in. And then come back and tell me "thank you." Heat the oil in a 12-inch nonstick skillet over medium heat. Add the onion, bell pepper, and jalapeño and sauté until softened, 5 to 7 minutes. Stir in the garlic, chili powder, cumin, cayenne, paprika, and 1/2 teaspoon of salt. Cook until fragrant, about 30 seconds. Add the beef, using a wooden spoon to break up any big pieces, and cook until it's no longer pink, 2 to 3 minutes. Stir in the water, tomato sauce, and pasta. Increase heat, cover, and bring to a vigorous simmer. Stirring frequently, cook until the pasta is tender, 10 to 12 minutes. Remove the skillet from heat and stir in the corn, green chiles, 2 tablespoons of the cilantro, and 1/2 cup of each of the cheeses. Taste and season with salt and pepper as needed. Sprinkle the remaining cheese over the top of the para, and bake until the cheese is melted, browned, and bubbly, 10 to 15 minutes. Cool 10 minutes, sprinkle with the remaining tablespoon of cilantro, and serve. Adding this to the must-make from Pasta Revolution!! I'll have to swap out the meat for something, but I'm sure it will still be delicious! I filed this away in my "remember this" part of my brain a year or so ago when I got that book, but haven't gotten around to making it yet. Clearly I didn't remember it! But now that I've been reminded I think I'm gonna have to make it next week! I had all the ingredients on hand so just prepped this for tonight's dinner. It is super yummy and I love that it only dirtied a cutting board and skillet. Winner! So glad to hear it!! Yes, my husband loved that there were barely any dirty dishes :). Thanks for letting me know that it was a hit! Yes, it was one of the first recipes I bookmarked, and I'm just now getting around to it. Definitely kicking myself for waiting so long! Let me know how it turns out for you! Definitely - I'll probably do black beans and mushrooms if I want a vegetarian version. It's been put into the dinner queue! Look delish. I loved this!!! Thank you for sharing! :) For anyone (like me) that can't find fire roasted tomato sauce in the store, I just threw a can of fire roasted diced tomatoes (muir glen brand) in a bowl and used my immersion blender to make a 'sauce'. Made so I needed to add a little extra water to make enough liquid to cook the pasta, but still turned out delicious!! Yay so glad you liked it! Good idea with the tomatoes - thanks for the tip! I've only seen fire -roasted tomato sauce once or twice. It would definitely be totally fine with plain tomato sauce, but I like the extra depth of flavor and smokiness you get from the fire-roasted. Hi Josie! Made this for dinner tonight. Turned out great. Had to dial it down for toddler palates - no cayenne or jalepenos - still turned out great! Thanks for sharing another success! Made this Saturday and everyone liked it! Hi Josie, I made this tonight with ground turkey and it was delicious! I, too, used fire-roasted tomatoes instead of sauce (I couldn't find it). This will definitely go in the rotation. Thanks! We had this last week, and I couldn't find my card to take pics, but it was delicious! I'm so glad you posted - totally reminded me to make this asap! I can't wait to make it again. So glad you liked it, Ronni!